True story. I spent one winter holiday in Italy with my father’s family, while my parents went on a vacation by themselves. My one uncle believed that I was too old to still be sleeping with a teddy bear. 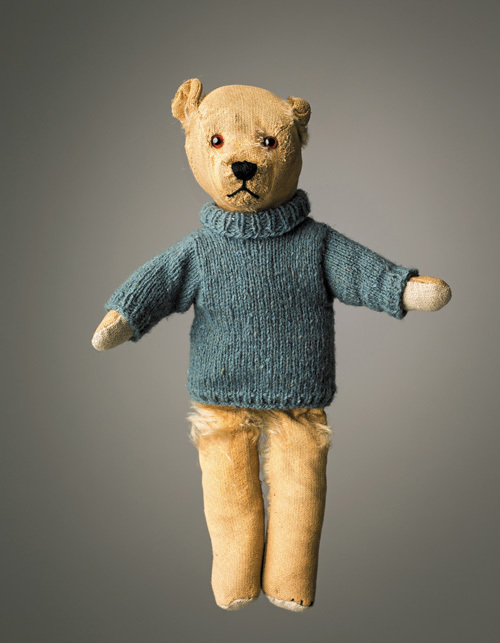 So, the day after my 10th birthday – as I slept in bed – my teddy bear was removed from my arms. When I woke up and demanded to know where my special friend was, all the adults decided that lying to me would be better than just simply saying, “Grow up, girlie. You’re too old to carry around a stuffed animal.” Instead, they made up a story about how a giant mouse must have crept into my room and thought my teddy would make good bedding for her children. I was furious. I never got my teddy bear back. For decades, academic papers and professional conference workshops have addressed the idea of transitional objects – blankies – teddies – those highly attached-to cuddle objects that go from hand to floor to mouth to bed without a second thought from the same mom who snatches the pretzel away from baby even if it falls within the 5-second rule. A pretty sound consensus exists that cuddle objects are not psychologically damaging to children. And, more importantly, no specific age exists for when special friends should be retired from everyday life. Researchers now know that humans have a naturally occurring cuddle hormone – oxytocin. Petting a beloved pet, getting a hug from someone we know, or clutching a special friend can stimulate our brains to release oxytocin. With oxytocin in our system, a person is more disposed to bonding, trusting, and building empathy with other people that they know. One psychologist from the University of Michigan, Dr. Christopher Peterson, once conducted an informal poll on special friends. How many college students had brought their stuffed animal to school? According to Peterson, roughly 80% of his female students and 10% of his male students in his mid-size lecture hall class publicly acknowledged bringing their lovey object to college. It can be hard to watch our children grow up with few friends in life. When you’re an outlier, it can happen. Oftentimes, it’s not a matter of our children not having appropriate social skills. Rather, it’s more a matter of not having an appropriate peer group. We see the sad effects of ostracism with children who have a physical disability or cognitive limitations, yet we never think to blame those children for not being more socially adept. So, why do we find fault with our gifted kids when they are not accepted by their age-peers? Worse yet, why do we feel compelled to disallow them the comfort of their one true friend who has always stood by their side? No straight-forward answer exists to the question of when is the right time for a treasured friend to be retired to the bedroom. But, I will leave you with one query to consider, if you’re struggling with this issue? What are your thoughts about ‘special friends’? Is there an age when they should be banned from leaving the house? This blog post is part of the HoagiesGifted August Blog Hop. Visit Hoagies’ Blog Hop home page to read more about gifted children and friendships, written by other professionals and parents of gifted kids. Back before I had kids, I read Tom Robbins’ novels. They were filled full of characters who thought and lived on the fringes of normal societal expectations. Let’s just say I probably had more in common with those characters than any Little Women you could think of. As a just-turned-21-year-old college graduate, one particular passage really struck me. You’ve heard of people calling in sick. You may have called in sick a few times yourself. But have you ever thought about calling in well? It’d go like this: You’d get the boss on the line and say, “Listen, I’ve been sick ever since I started working here, but today I’m well and I won’t be in anymore.” Call in well. I spent about 1 year in the professional work world before I became a full-time stay-at-home mother. I never took the chance of calling in well before I had kids, but the idea stuck with me and became part of my parenting plan. Gorgeous spring day? Great! Schoolwork could wait because an emergency visit to the zoo, with a picnic lunch, oftentimes took priority. When you’re 7-years old, you’re not really missing out on much when you play hooky. But, what about high school? Can you really miss days just because, well… you don’t want to go? One of my kids attended public high school for a short while. Year 1 went pretty well. Year 2, not so much. He had 2 art classes, 1 AP class, and pre-calc (as well as a bunch of dual-enrolled classes at a local college). Grades weren’t an issue. It was just all the other stuff that comes with high school. He couldn’t take the day off just so he could miss a test or skip handing in a project. He had to keep track of how many missed days he had, since the school had a policy that if you missed X days, you automatically failed the quarter. Failing by default was not an option. Well days could not be used to catch up on schoolwork. They had to be used for fun or relaxation. After a few weeks of “calling in well”, something groovy happened. Life got better for everyone. From a psychological perspective, you could call this helping a kid gain an internal locus of control. Rather than passively see one’s self as a victim of a system or the whims of others, a person learns to take responsibility for the course of their life and outcomes. From a practical perspective, school was still the best of times and the worst of times. But, amidst all that foolishness, my kid gained some wisdom as he learned how to create healthy boundaries for himself – while still meeting his school obligations. I got criticized for being an “indulgent parent”. But, I saw it differently. If I could trust my young teen to take early college classes, then I owed it to him to trust that he knew his personal, social-emotional limits with the social scene at high school – and I had no choice but to support him. This blog post is part of the 2014 SENG (Support the Emotional Needs of the Gifted) National Parents of Gifted Children’s Blog Tour. Follow the Blog Tour all week and read other great blogs about the joys and challenges of raising gifted children. How do you support your kids when they need a break from school or learning? Would you allow them to call in well? Back when my oldest child was at the tender age of 5, attending the local magnet Kindergarten, we had a very short conversation in October that immediately seared itself into my mind. Me: Come on. Let’s go. We’re going to be late for music class. Him: But I just got home from school. Me: I know, but we have to drive across town. Him: But I just want to play. Me: You don’t have time to play. We have to leave now. As those very words escaped my mouth, “You don’t have time to play”, I knew I was doing something wrong as a parent. Soon after, I made the decision to homeschool and to trust in my children’s ability to lead the way to a different style of learning – one based on their natural curiosity. Go ahead. Watch the video. It’s Mr. Rogers auto-tuned. It’s sweet! When the garden of my children’s minds was allowed to take root, fascinating things happened. The way in which they played with the world around them opened up new ideas and deeper understanding. Take the day I was mowing the lawn, my one guy was climbing a tree and my other kiddo was throwing a stick. I knew he was throwing stick because I got hit with it. Sure, he apologized – but he went right back to throwing it, again. The stick hit me a second time, so we had a little talk. He told me that he wasn’t aiming the stick at me. So, why do you keep throwing the stick? Because it does something different when I hold my hand different ways, he excitedly explained. Really? We walked over to a row of bushes and, sure enough, he aimed his stick at that direction and showed me what he meant. If he threw the stick, starting with his hand behind his head, the stick went a certain distance forward. Instead, if he threw the stick upward with his hand at his knees, the stick would travel high but not very far. For my little guy, this discovery at the age of 4 was a goldmine of data. All kinds of stick-distance throwing permutations existed and wanted to explore them all. For me, I was grateful that I had the patience to not yell after getting hit with the stick a second time and to try to understand the world from my little guy’s experience. I skipped the physics lesson that could’ve been “taught” and simply went back to mowing my lawn – after confirming that my little guy understood that throwing sticks into bushes was the only acceptable direction for his experiment. The play that my kids engaged in rarely looked like what you would find in a typical suburban backyard. Some days I would hear loud crashing and banging as they continued to seek to understand the cause and effect of projectile motions. Or, maybe they just really loved to be covered in bruises as they jumped off their swingset seats at the peak of their forward swing to see how far they would land. Other days, they would rule over their kingdom of beanie babies and stuffed animals as they created imaginary worlds full of legal systems, religions, cultural conquests, and a competition for natural resources and land. It was as though the Civilization video game they loved had come to life in my living room. Years have passed since that fateful day I proclaimed no time for play existed. As my guys got older and their hunger for deeper academic learning increased, we found a balance between play and school. My guys have accomplished all sorts of groovy gifted things that might make a person go, “Owwww”. At the same time, certain achievements just slipped by them. Neither one ever made SET. And no one is a master chess player – but they did master mud fairy hut building. I’m okay with that. As my kids stand poised to get their first apartment together as young men, I can look at them and see how their unstructured play helped form their lives. The former leader of imaginary kingdoms recently completed grant-funded research on the democratic peace theory. My hands-on kinesthetic learner is devoting his energy to building houses. Would either kid be in the same place today if I had been busy looking at my watch saying, “It’s time to sit down and do algebra now”? Anything is possible, I suppose. What I do know is that the power of trusting in play – which is no easy task when you have state homeschooling regulations to meet – does lead to positive outcomes. Hoagies’ Gifted Education Page Blog Hop: Gifted @ Play. Hoagies’ Gifted is chock full of information and resources for every aspect of giftedness. Check out Hoagies’ and read the other great blogs participating in Hoagies’ June Blog Hop! I’m not a big fan of Mother’s Day. Call me an ungrateful curmudgeon, but the last thing I want is breakfast in bed. Between the ever hungry four-legged kids and the super-proud human ones, something inevitably gets spilled… And, that just means more laundry for me. I am no June Cleaver and, even though I’ve done my share of roaring, I am no Amy Chau. Instead, I like to think of myself as the best-mom-I-can-be, which happens to be better some days more than others. Part of my avoidance with the Mother’s Day stems from a dirty little secret that I’ve carried for years. You see, while I love my kids dearly, I’ve lived through days when I wished I wasn’t a mom. Regular stories appear in the paper about mother’s who abandon their children. Dads up and leave families all the time, but when a mother does it, society cries, “FOUL!” and harsh judgment ensues. Nebraska officials never foresaw the level of desperation some parents feel. In 2008, the state passed a safe-haven law allowing parents to abandon their children, with immunity, at a fire station or hospital. In some cases, parents from as far away as Florida drove more than 1,000 miles to unload their kid. Unless you’ve lived with a high intensity child and little local support, you may not fully understand the mixed bag of emotions mothering brings. Consider the day that starts way too early. You’re operating off of three hours of nightly sleep for a week running. No one naps. Everyone’s hungry. Nothing tastes good. The cat gets sick all over the pile of clean laundry that’s been waiting two days to be folded. Whining turns into bickering which turns into yelling. And, that darn kitchen fairy never shows up to help with the dishes. Add in a “healthy” dose of PMSing hormones and bad cramps and you might understand that feeling of just wanting to disappear. I knew I wasn’t totally alone in my frustration when I spoke with my former mother-in-law one day. As a woman who birthed five children within a six-year period, she agreed that some days the thought of keeping the smelly garbage in the kitchen and putting the kids out on the curb for pick-up was quite appealing. Somewhere along the line, a friend recommended that I read Raising Your Spirited Child . She knew I suffered from serious sleep deprivation, but she insisted I find the time to read the book. I found myself overwhelmed with relief when I read Kurcinka’s section on the names we privately call our children. Explosive, whiny, stubborn, and a few more colorful selections confirmed that I was not the only parent to think I didn’t have a perfect child. Rather than castigate us for admitting our very-human feelings, the author encourages parents to step back and rethink those labels. Inflexible? Maybe you’re raising a “traditionalist” who will become the next Glenn Beck. I decided to reframe my thinking and begin to think of my kids as “committed to their goals.” As adults, this characteristic would serve them well in pursuing careers, achieving dreams, and, um, sticking around those tough parenting moments. In the meanwhile, I guess I could get through the short-term goals of wearing shorts in the winter. Once I began to change the way I looked at my children, a funny thing happened. No, I didn’t magically get more sleep. But, one night before I got into bed, I found a tiny hand-scrawled note lying on my pillow. It read: You’re the best Mamma. I’m glad I chose to ignore the pitter patter of little feet later that night, because that must have been when he snuck into my room to leave his love note. What made finding that scrap of paper so special is that it was written by my 6-year old who was “committed” to not picking up a pencil to write – ever. The act of writing literally reduced him to tears. Yet, somehow he managed to print out the words just for me. I saw it as a sincere act of love. I suppose in the back of my mind, I knew there was no doubt I would stick around in my mothering role for the long run. I was lucky enough to have friends to call and talk me through the harriest of times. I still have my Best Mom “award” stuck to my refrigerator door, all curled and faded. I keep it to remind myself that even on the worst of parenting days, if we can calm ourselves, sometimes a tender shoot of hope arises from the day’s ashes. NOTE: This blog entry originally appeared on the Owings Mills patch.com site in 2011. What in life touches us deep within our core and just makes us sad? As adults, most of us have the self-awareness to reflect on a question like that and recognize our triggers. Maybe it’s the sight of a plate of peas and memories of what would happen if we didn’t eat them. Maybe it’s the game of dodgeball and the memories of having always been picked last before being targeted for the most mean-spirited throws. Or, maybe it’s a not-so-innocent nickname that lead to relentess teasing. The death of a monster-of-a-person family member has brought up all kinds of childhood memories in our house, recently. More comforting memories of seeking solace have also returned. For one of us, school and sports offered an escape – a chance to heal and find strength to go back home everyday. For the other, school simply deepened the pit of despair and made the idea of hope even less tangible. Yet, we both survived – just like countless other children have and will. And, when I saw this video, again, I think I finally figured out how it happened, even when there were no adults present to encourage something better. I adored hopscotch as a child. I could literally play for hours, by myself – especially when I was the only person on the school playground. Something about the cadence of moving forward compelled me to just toss my pebble, yet again, to see how fast I could hop my steps without touching a line, especially when the space got narrow at the arched top of the painted grid. As an adult, my sport of choice is swimming, especially when I’m stressed out. The repetitive motion of slicing my arms through a tranquil pool and regulating my breathing is like a spiritual practice. I purposefully clear my mind and count my laps like a mantra as I move forward in the water. When I get out of the pool, nothing has changed in my life. The same stressors still exist. Chances are, new deadlines may have even been added to my life while I indulged myself in me-time. Yet, something about that motion – that power to suspend my reality, even if just for 45 minutes so I could play hopscotch or swim laps, and control every motion with the one goal of just moving me forward – something about that motion allows me to change my perspective in how I view my problems. Perhaps one of the greatest lessons we can teach our children is that we cannot always change our circumstances or the way we’re treated by others. But we do hold the power deep within to exercise our choice to move forward, nonetheless.